This userscript adds voting options to the sidebar of Close Review and Low Quality Review of Stack Exchange sites, as well as Help & Improvement Queue on Stack Overflow. 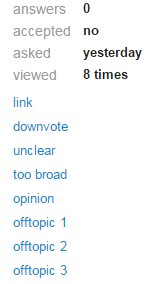 Here, the options invoke API methods to downvote the question, or to vote to close. Voting to close does not count toward the daily limit of review tasks. However, it advances the queue by automatically clicking Skip button. Downvoting does not advance; thus, one can downvote and then vote to close. It is also possible to undo the downvote (within the usual time limits). Duplicates, migration and custom close reasons are not included in the options. The descriptions of off-topic reasons are shown in abbreviated form; full descriptions are available on hover. The only option added here is to downvote the post. The script requires an access token, which can be obtained from URL hash after following this link and authorizing the application. It should be entered in place of ACCESS_TOKEN string in the script.